Tired of the same old oatmeal? It can get pretty boring! 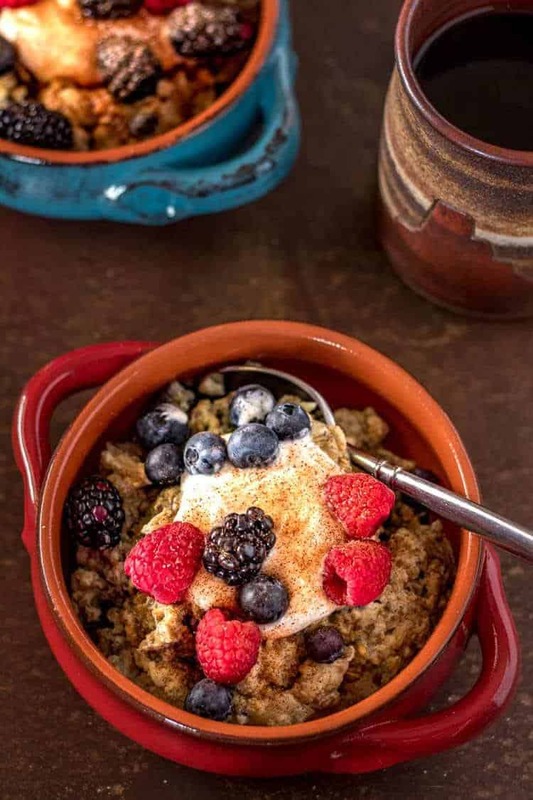 Instant Pot Steel Cut Oats Breakfast Pudding is a new “spin” on a breakfast mainstay – healthy steel cut oats cook quickly in your Instant Pot/pressure cooker with an egg and milk mixture that when finished may remind you of bread pudding. Customize it with dried fruit, nuts, and spices for a tasty breakfast treat! ~~ Elizabeth Wharton, American novelist. Breakfast rut? Do you find yourself grabbing a box of sugar-laden cereal, or worse yet, skipping it entirely? I would submit that it is difficult (if not impossible) to maintain a healthy weight and lifestyle without a healthy breakfast. My plan of attack is twofold: 1. Get adequate protein to start my day. I aim for 10-15 grams minimum. I’m currently trying to lose a few pounds, so I’ve cut way back on carbs. Normally, I include carbs as well, but the focus is on the protein. 2. I need variety. I’m not suggesting that I cook every day, however, I do keep a variety of protein and fiber rich cereals, nut milk (we’re cutting back on dairy), eggs, lean turkey breakfast sausage, cornmeal, grits, whole grains, and good stuff for protein rich smoothies. Oats (Avena sativa) are a whole-grain cereal mainly grown in the US and Europe. Oats are very well-balanced with 66% carbohydrates, 17% protein, 7% fat, and 11% fiber. Just one of many reasons to love oats is they pack more protein that most grains! They are high in vitamins, minerals and antioxidants. 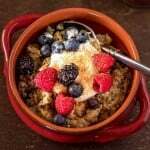 In fact, whole oats are the only source of a unique group of antioxidants called avenanthramides believed to offer protection against cardiovascular disease. All oats are not “created equal.” Let’s sort this out: 1. Raw oats are newly harvested and you won’t likely find them in a store; they have an inedible hull. 2. Whole oat groats are simply cleaned and the inedible hull removed. Required cooking time is 50-60 minutes, and they need to rest covered for 10. If you love whole grains, they’re worth the wait! 3. If you cut oat groats in 2 or 3 pieces with a steel blade, you get steel cut oats… hence the name. 😉 They cook more quickly than oat groats (20-30 minutes is typical) on the stove. You may also find quick cooking steel cut oats, but they don’t have as much texture. 4. Scottish oatmeal is ground with a stone rather than a blade, and the result is more varied sizes. It results in a creamier texture than the steel cut oats due to the many small bits. 5. Old fashioned or rolled oats are steamed and rolled into flakes. We use these regularly! You will find them in my Green Chile Savory Oatmeal With An Egg. They cook in 5 minutes. 6. Quick rolled or instant oats are rolled thinner and steamed longer than old fashioned oats, and they cook in as little as a minute. I rarely use them as I prefer more texture. 7. Oat flour is a whole grain that is awesome for baking, thickening stews, etc. All oats are considered “whole grain,” and do not lose their nutritional value. Non-contaminated oats are considered gluten free. I would look for gluten free certification on the label before consuming if you follow a gluten free diet. I look to Bob’s Red Mill for gluten free oats because I trust their products completely! If steel cut oats cook on the stove in 30 minutes, why mess with the Instant Pot/pressure cooker? YOU. CAN. WALK. AWAY. Applause! I don’t want to stand at the stove and stir for 30 minutes. If you forget to stir, you have scorched steel cut oats. Additionally, this “pudding” has a custard base. You’d have to bake it in the oven to get similar results. My first go-round with this breakfast dish, I cooked it directly in the pot. We actually really enjoyed the slightly crunchy bottom, but it didn’t look pretty at all. I opted to go for a steamed approach, and I (and hubby Mark) loved the results! 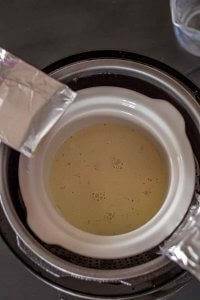 I pour 1 cup of water into the bottom of my pressure cooker pot. Next comes my steamer basket. Combine the “pudding” ingredients, and pour them into a suitable container sprayed lightly with cooking spray. Construct a “sling” out of foil to retrieve the actual cooking pot. I used the small ceramic crock from my small slow cooker very successfully, but I plan to get a stackable steamer set as I’m sure it will get used often. Until then, I found this set up works well. (See photos below). I set the pressure cooker for 11 minutes on the manual setting. I then went to a natural pressure release for 10 minutes before opening the valve. Grains create a lot of foam while under pressure, and it needs to settle. So, the Instant Pot/pressure cooker does slightly speed up the cooking time, but for me, the “win” is in not having to babysit a pot on the stove! After pouring 1 cup of water into the pot, I set in a steamer basket, and make a “sling” from foil to retrieve the pot when the “pudding” is done. Set the foil “sling” in the pressure cooker atop the steamer with excess folded over the sides of the pressure cooker. Set in the cooking pot with the “pudding” ingredients mixed thoroughly. Fold the foil over the pot, then lock lid in place and proceed. The completed breakfast “pudding” ready to spoon into bowls and top! At the risk of being repetitive, protein is a very important part of a healthy breakfast. A simple bowl of oatmeal is good (not great) because 1 serving has only 6 grams of protein. As I mentioned, I’m looking for 10-15. Adding the custard brings in additional protein from the egg and nut milk (I use a protein nut milk), and the scoop of Greek yogurt brings in even more.This breakfast “pudding” lends itself beautifully to customizing. You can add spices (cardamom, cinnamon, cloves, allspice, nutmeg), dried fruits (craisins, raisins, cherries, dates, blueberries), nuts (almonds, walnuts, hazelnuts, pecans). We prefer it very lightly sweetened, and I specify 2 teaspoons of brown or raw sugar. You might prefer honey or agave nectar. Lastly, the “pudding” gets topped with a scoop of vanilla Greek yogurt and fresh berries… another opportunity to switch it up! I really hope you’ll give this one a try, and please let me know how you like it. I have a comment box at the bottom of the post, and I love to hear from my readers! I had the opportunity to review some new products from Bob’s Red Mill that are healthy and nutritious. 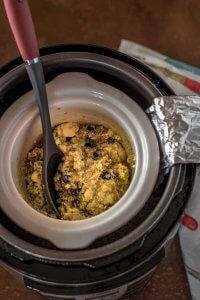 When you don’t have time to “mess” with Instant Pot Steel Cut Oats Breakfast Pudding, you’ll find this to be satisfying alternatives. I sure did! Tired of the same old oatmeal? It can get pretty boring! 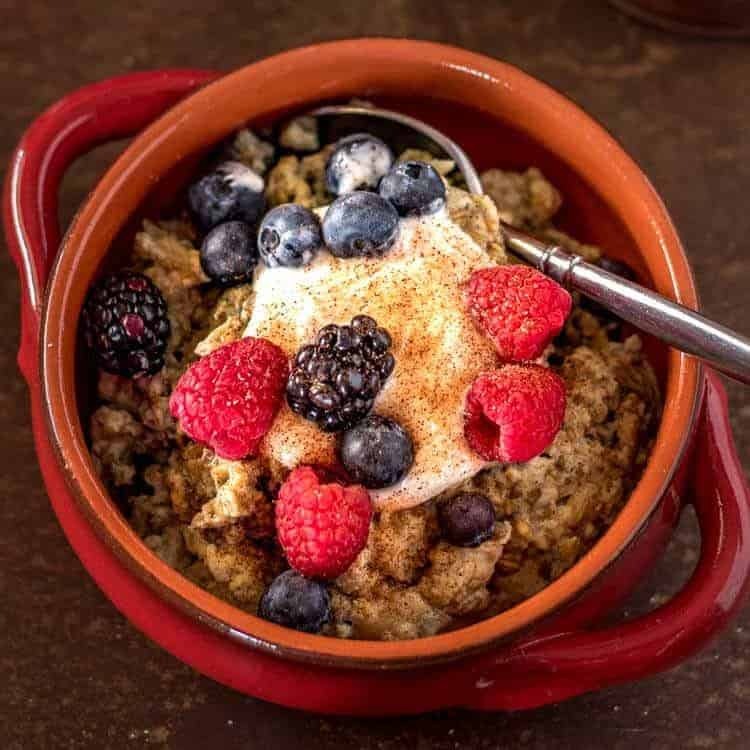 Instant Pot Steel Cut Oats Breakfast Pudding is a new "spin" on a breakfast mainstay - healthy steel cut oats cook quickly in your Instant Pot/pressure cooker with an egg and milk mixture that when finished may remind you of bread pudding. Customize it with dried fruit, nuts, and spices for a tasty breakfast treat! 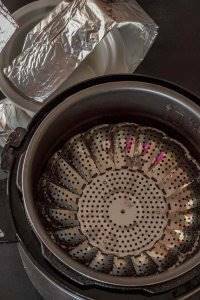 Add 1 cup of water to the bottom of your Instant Pot/pressure cooker. Using an appropriate pot set on a steamer basket (see post), pour the egg and oats mixture into the pot. After preparing the steamer/pot combination (see notes), lock lid and set for 11 minutes on manual. Do a natural pressure release for at least 10 minutes before opening the valve. Spoon the pudding into 2 bowls. 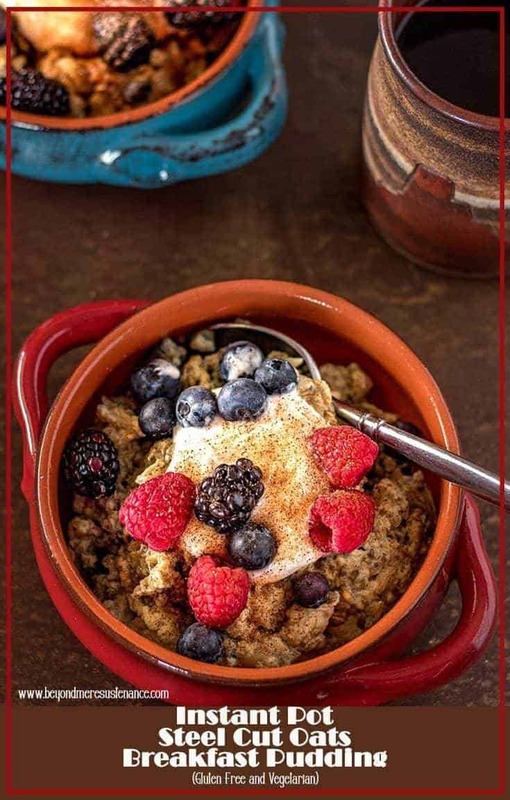 Finish it off with a scoop of Greek yogurt, berries (or other fruit), and sprinkle with cinnamon-sugar if desired. Protein is an important part of a healthy breakfast. We've cut way back on dairy, so I use protein nut milk. Use whatever type of milk you prefer. I often refer to this chart for pressure cooker cooking times. I used a combination of blueberries, blackberries, and raspberries, none of which needed prep (slicing or chopping). I included 1 cup for 2 servings in the macronutrients found below. As I mentioned in the post, I do not yet own an accessory for my pressure cooker to accomplish this task. I am really good at "making do," so I used my pressure cooker steam basket with the crock from my slow cooker. 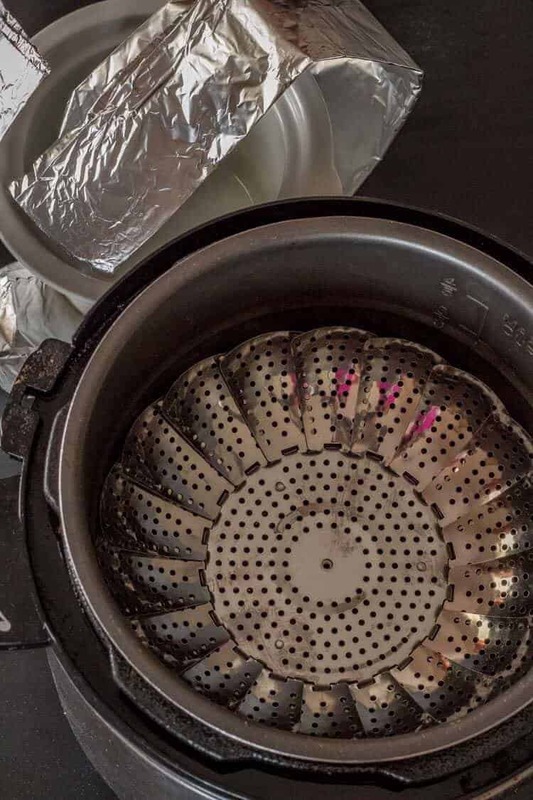 Don't forget a foil sling to make it possible to lift it out of the pressure cooker! (See photos in post). Absolutely love it! Such detailed and well explained post Tammy! Thank you Sonal! I always hope it's clear enough to complete successfully! This is very nutritious and filling, and it tastes great as well. There are a lot of possible variations on this recipe.